Of course, upon the return visit, if I learned that the plan wasn’t followed or that my patient hadn’t progressed, I took it personally and wondered what I could have done better. Thankfully, with time and practice, my boundaries firmed up and I began to trust deeply in my work. It was helpful to remind myself that I truly am only part of the equation in this partnership and cannot be successful without my patients doing their part as well. However, I was still craving some re-assurance that after the visit was over and they had left the supportive, almost “cheerleading” environment of my office that my patients could comply with my recommendations. One of the tools I incorporated to assist in assessing this issue is called the “Adherence Loop”1. Patient Adherence can be defined as a patient playing an active and willing role in their plan of care to gain maximum benefit. It is exactly what I want from my practice! In order for people to adhere to a plan there are certain action points that they need to move through almost in a loop type fashion as described in "The Adherence Loop" - developed by Dr. Devorah Klein. Believe: People need to believe that they have the condition, that the recommendations will work, and that they can be successful. Frame: They need to build a mental model, or framework, of how the recommendations will work on their condition. Know: They need to know the rules and what to expect. Act: Action requires resources: physical, cognitive, emotional, social, and financial. 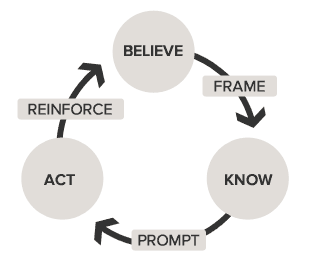 Reinforce: Feedback reinforces belief to strengthen and drive adherence. - Do patients want to change or is someone else telling them they need to change? - Do patients believe there is really a solution that will work for them? - Do patients believe they can have success? - Do patients have an accurate understanding of their health? - Do patients have an accurate understanding of how the recommendation works? - Do they know what to expect from carrying out the recommendations? - Do patients understand the rules of the regimen? - Are patents overwhelmed by information? - Are patients not getting information? - Are patients getting misinformation? - Are patients forgetting to take doses? - Is the regimen hard to keep track of (inconsistent, not memorable, alien to the patient’s other routines)? - Is the therapy physically hard to take (painful, difficult to administer, time consuming)? - Is the therapy socially challenging (embarrassing, awkward, requires space or equipment)? - Is it difficult to get (financially, logistically)? - Does it require the help of another (caregiver)? - Is there feedback that the therapy is working? - Are there any negative side effects? - Do patients notice an immediate or delayed improvement? - Are people rewarded for action? - Did the action meet expectations? I have had countless experiences where a plan was able to be exponentially more effective once I found out through this tool, where the either potential or real disconnect was.